SUMMARY: This case study covers an event marketing effort to create an event sponsor guide that came together in 11 days, met a need for the target audience and led greater brand awareness for the company that executed the campaign. Read on to find out how Loggly — a cloud log management company — was able to leverage its main industry event and help its peers, generating 25 leads for one competitor and driving traffic to Loggly's website and blog. Why did they do it? And how? Read on to see how this surprising tactic generated over 1,000 leads for Loggly. Marketing is typically a well-thought-out process, composed of campaigns based on short and long-term strategies and utilizing tactics planned out in advance. But, as this case study will show, sometimes being agile and reacting to marketplace opportunities can lead to success. David Ewart, Vice President of Marketing and Growth, Loggly, a cloud log management service company, designed and executed a campaign that met a need for its marketplace's main trade show in less than two weeks. Loggly's customers are development operations executives and developers in markets such as mobile and entertainment apps, gaming, ecommerce and travel websites. Loggly offers cloud-based log management services to help DevOps, a software development method that focuses on communication and collaboration, manage activity logs to help faster solve operational problems. 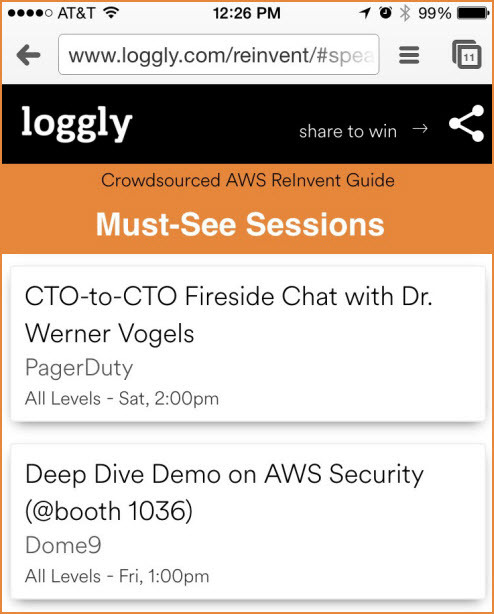 Amazon Web Services re:Invent 2014 (also known as AWS) is the major cloud computing trade show, and each year Loggly has been a part of the event, the company sets out to make as much of a splash as possible. The 2014 show had an impressive 13,500 attendees from 63 countries, proving just how large this show is in the industry. Because Loggly is an SMB competing with Diamond level sponsors, such as Intel and Accenture, at the event, the team looked to engage in event marketing campaigns to help stand out in 2014 among 260 sponsors, which spanned all size of companies. In 2012 the Loggly team brought the company mascot — Hoover — to the show, and in 2013 Ewart spoke, but for 2014, Ewart felt the stakes needed to be raised. He realized that the event did a great job of promoting the sessions but did not put as much effort into promoting the event's sponsors. Eleven days before the event began, Ewart saw an opportunity to create a guide for the AWS show's sponsors that would not only help the event's attendees, but would also help create brand awareness and website traffic for Loggly. "Every vendor wants to be there and be featured there," said Ewart, "and AWS 2014 was really no different. I think there were 260 different sponsors, so we wanted to stand out." Realizing the event itself was promoting the sessions and speakers, but not the event sponsors, only 11 days before AWS 2014 began, Ewart decided to crowdsource a guidebook on the sponsors for the show's attendees. "They're not as strong at promoting the sponsors, especially if you don't subscribe to the highest level package. So, I wanted to get Loggly involved in that conversation, and that's really my goal here on the marketing side — having us be found and being considered. And I wanted to do it in a way that would benefit both vendors and attendees," he said. Providing a service that benefitted both competitors in the form of other vendors at the show and the event's attendees was an opportunity for Loggly to stand out at the show. Ewart added that he felt this initiative would achieve that goal because the event was based on cloud computing, a space he described as "openness of information and sharing." Ewart used an online resource to go through the sponsor list for AWS 2014 and compiled a list of email addresses for all 260 vendors. That list was sent a request to fill out "an unofficial crowdsource guide for AWS re:Invent" with an offer to submit information on their booth swag, parties they were sponsoring, sessions they were presenting and even just tips on enjoying Las Vegas, the location of the event. Two emails were sent the list — one immediately after the team received the list from the online resource and a follow-up two days later. Out of those 260 sponsors, 80 submissions came back contributing to the guide. From there, the team took that input and created a Google document that they curated and promoted in Loggly's blog beginning about a week before the event launched. Ewart said one vendor complained directly to the event coordinators, and AWS reached directly back out to Loggly. The event not only supported the initiative but retweeted the blog post and the guide. "The irony here," stated Ewart, "is that the same vendor that initially complained came back two days later and begged if they could be included in the guide once they saw [that] it took off." The first stage of the campaign happened in less than a week — going from idea to the crowdsourced guide being shared via the Loggly blog. He added that the vendor was included because he believes the rising tide lifts all ships. 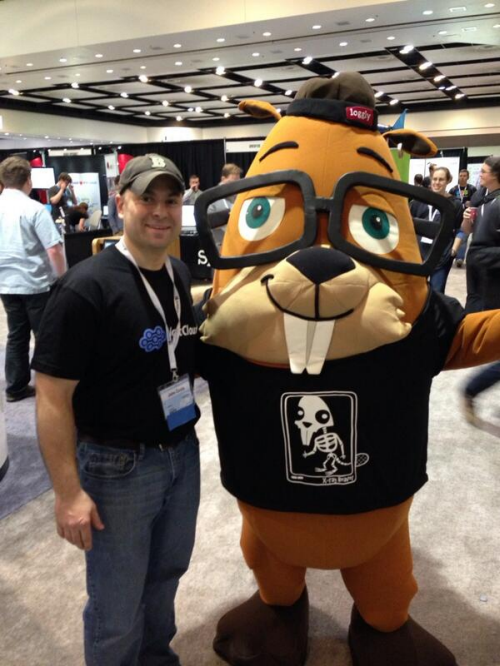 Loggly's blog post promoting the vendor guide was popular immediately, and the team at AWS reacted to that success. 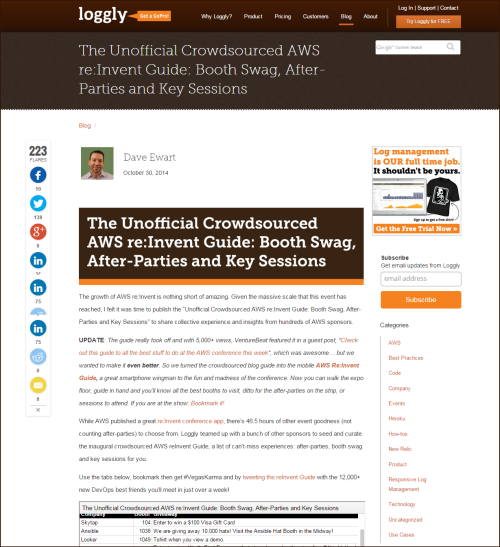 "When they saw this blog go viral, they wrote a newbie's guide to AWS re:Invent. When they heard about the continued traction of [Loggly's guide] and how it ranked number one on Google search for 're:Invent guide,' they put more fuel on the fire on their own newbie's guide, and they put [their guide] on the homepage of ASW re:Invent," Ewart said. Vendors in Loggly's guide also responded by retweeting the blog post. Beyond these tweets, a direct competitor of Loggly started buying the keyphrases "AWS re:Invent guide" and "AWS crowdsource guide" for its online ads. Ewart said, "I took [that] as a badge of honor that something we had created stirred up so much interest [and] became a high-priced keyword." He added, "If they wanted to throw good money at it, I'll take that as a compliment." Realizing this last minute campaign was taking off, Ewart decided to take it to another level — mobile marketing. According to Ewart, "Having done this event three times and knowing how large it was going to be, and really knowing what drives people to booths, I thought, 'How can we make this better for the attendees?'" He walked to the engineering side of the Loggly office, found a front-end engineer and asked, "Is there some sort of mobile framework that I could get this guide into in a rapid period of time?" They decided it was possible, and Ewart drew up a whiteboard of the mobile guide and snapped a photo of that image with a smartphone. One of his coworkers had a connection via LinkedIn who could turn that photo and the online guide into a mobile app, and Ewart went with her recommendation on the mobile app developer. That process took three hours to get a project plan in place and get the mobile app development started. As Ewart described, it took "an iPhone [number] forward, three text messages, a five minute phone call, and the app was underway." The total campaign involved three internal resources, including Ewart, and three external resources at a cost Ewart wouldn't share but described as less than printing 250 pieces of four-color collateral. The goal of this campaign was to stand out in a crowded field at the industry's largest trade event of the year. Essentially, this effort was based around creating brand awareness more than anything else. Ewart stated, "One vendor reached out, found me at the booth and said, 'I really want to thank you so much. We have over 25 people book appointments directly from your guide." Another vendor messaged him with, "I can't wait to find you at the event. I'm going to give you a big hug." The mobile guide peaked with 676 unique views on the first day of the event, with an overall average time of just under five minutes per use. AWS re:Invent 2014 garnered Loggly over 1,000 leads and conversations, representing the company's highest level of engagement of its three years of attending the event and a 30% increase over its 2013 performance. The event also resulted in 2.24% of booth conversations originating from guide or blog post visitors who had their first exposure to Loggly via the guide. 23% of those conversations are now in trial with Loggly, and 18% have already turned into paying accounts. "This was our highest level of engagement in the three years we participated [in AWS re:Invent]. Most importantly, we injected ourselves into quality, topical conversations by providing — even tangentially — value in advance," Ewart explained. He added, "People knew us from the guide efforts, sought us out and then got to know us better at the booth." About this entire quick-hit agile marketing campaign Ewart said, "The lesson learned is time is immensely valuable, especially for this audience who are tasked with supporting some of the world's most prolific and revenue generating websites today. This guide helps people save time and it aligns to Loggly because Loggly is in the business of helping this exact same audience save time in their operational issues."